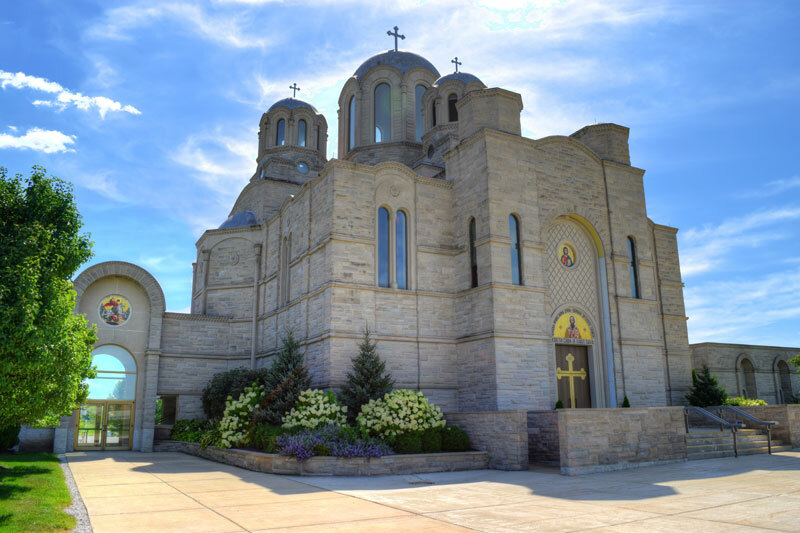 Join us for Divine Liturgy beginning Thursday, Jan. 19 at 9:00 a.m. for the Great Blessing of Water celebrating Holy Theophany at St. Sava Church, Merrillville, Indiana. This observance commemorates Christ’s baptism by John the Forerunner in the River Jordan, and the beginning of Christ’s earthly ministry. The Feast of Theophany is the culmination of the Christmas Season. In mystic commemoration of this event, the Great Blessing of Water is performed on this day, and the holy water so blessed is used by the local priest to bless the homes of the faithful. 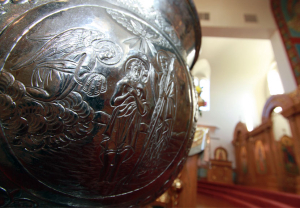 This image depicts the baptismal font used in St. Sava Serbian Orthodox Church, Merrillville, Indiana. Etched on one side is the scene commemorating Christ’s baptism by John the Forerunner in the River Jordan, and the beginning of Christ’s earthly ministry. The feast is called Theophany because at the baptism of Christ the Holy Trinity appeared clearly to mankind for the first time—the Father’s voice is heard from Heaven, the Son of God is incarnate and standing physically in the Jordan, and the Holy Spirit descends on Him in the form of a dove. The services of Theophany are arranged similarly to those of the Nativity (Historically the Christmas services were established later). On the morning of the feast, the Divine Liturgy of St. Basil the Great is served. The Liturgy of the feast begins with psalms of glorification and praise instead of the three normal Antiphons. And the baptismal line from Galatians 3:27 replaces the Thrice-Holy. For as many as been baptized into Christ have put on Christ: Alleluia. The Gospel readings of the services tell of the Lord’s baptism by John in the Jordan River. The epistle reading of the Divine Liturgy tells of the consequences of the Lord’s appearing which is the divine epiphany. Since the main feature of the feast is the blessing of water. It is prescribed to follow both the Divine Liturgy of the eve of the feast and the Divine Liturgy of the day itself. But most local parishes do it only once when most of the parishioners can be present. The blessing verifies that mankind, and all of creation, were created to be filled with the sanctifying presence of God. In connection with the feast, it is traditional for the priest to visit all the homes of the faithful for their annual house blessing using the water that has been blessed at the Theophany services. Look for a schedule of home blessings to be posted here soon at www.saintsava.net/blog to learn the days where Father Marko will be in your community blessing homes.